Brett Kavanaugh spoke at Harvard Law School on Oct. 27, 2017. WASHINGTON — When Elena Kagan was dean of Harvard Law School, she was in search of rising conservative legal stars. The traditionally liberal campus, the thinking went, could use a little ideological diversity with more robust debate and the challenge of different viewpoints. 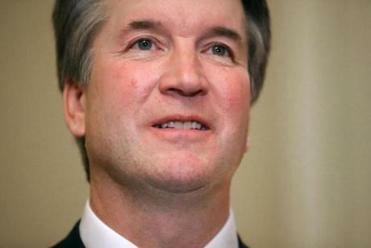 Among Kagan’s hires, as a visiting professor, was a newly appointed federal appeals court judge from Washington named Brett Kavanaugh. Now, more than a decade later, the two could become colleagues at the pinnacle of judicial power, where Associate Justice Kagan is entrenched in the Supreme Court’s liberal minority and Kavanaugh, if he wins Senate confirmation, would help conservatives cement a potentially decades-long grip on the high court. After Kagan tapped him for the prestigious gig, Kavanaugh often taught during the winter term for an abbreviated course that crammed an entire semester’s work into a several-week period. He established a reputation as collegial, accessible, and generous with his time. His courses were popular, and he developed quick relationships with students, often dining in Cambridge with small groups and offering them references or career advice. Left- and right-wing advocacy groups have sharply different views on the fitness of Judge Brett Kavanaugh to serve on the Supreme Court if confirmed. “He had large signups. The students obviously appreciated him,” said Charles Fried, a longtime Harvard Law professor who was solicitor general under president Ronald Reagan but later supported Barack Obama. Kavanaugh dined in the faculty lunchroom, grabbing a salad and grilled chicken from the buffet and having polite discussion with other faculty members. At the time when Kagan hired Kavanaugh, there had been controversy over some of her additions to the faculty — particularly Jack Goldsmith, an international law expert who was criticized for his role in the Bush administration’s policies in response to terrorism. But Kavanaugh’s presence provoked no outcry. Visiting professors at Harvard Law often come for a year and, if it goes well, they continue. Kavanaugh taught for 10 years. “There was no controversy about it,” Fried said. In his acceptance of the nomination Monday night at the White House, Kavanaugh mentioned his teaching at Harvard. “I remain grateful to the dean who hired me, Justice Elena Kagan,’’ he said. His service at Harvard Law School is but one facet of Kavanaugh’s solidly mainstream credentials. He’s a Yale Law graduate; clerked for Associate Justice Anthony Kennedy, whom he has been nominated to replace; and worked in Republican George W. Bush’s White House before being nominated for the D.C. Circuit Court of Appeals. 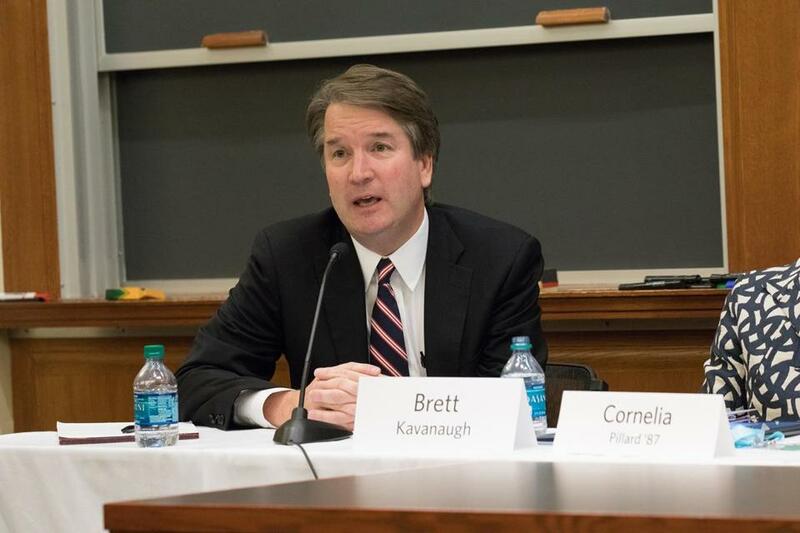 Harvard Law touted Kavanaugh’s ties to the school on its website after his Monday night nomination and included laudatory statements from fellow professors, including Goldsmith. “An inspiring teacher and mentor,” said John F. Manning, the current dean of the law school. While the separation of powers has been the most frequent focus of his class, in recent years he has taught a class on the Supreme Court. About three years ago, he asked students what questions they would ask if they were the president interviewing a Supreme Court nominee. The judge’s stints at the school overlapped with Elizabeth Warren’s tenure as a professor, but she has no memory of him from that time, according to an aide to the Massachusetts Democrat. She certainly knows who he is now. After class at Harvard, Kavanaugh would slip on his ballcap — from Georgetown Prep, his high school, not Yale — and head to office hours where students crowded to meet with him. He would often organize dinners with smaller groups of students at places like Cambridge Common or Cambridge One, former students said. He helped her refine a piece she was doing for the Harvard Law Review. He later provided recommendations for jobs — and, ironically, she got a clerkship working for Merrick Garland, the chief justice of the D.C. circuit court where Kavanaugh served. Garland was Obama’s Supreme Court nominee, which Republicans blocked for nearly a year until Trump won the election and took office. “He wanted people to disagree. He wanted to hear the different sides. I think he liked nothing more than having two people really engaged in the reading and disagreeing and debating about it. Others who took Kavanaugh’s course agreed. Most entered the room well aware of his politics, she said, but it was not a major issue.